Combine rum brandy sweet potato purée, orange juice and bitters in shaker. Shake sharply and strain into coupe glass. Sink Tia Maria to the bottom of the glass, and float cream on top. Add 2 dashes of angostura bitters and swirl with toothpick. 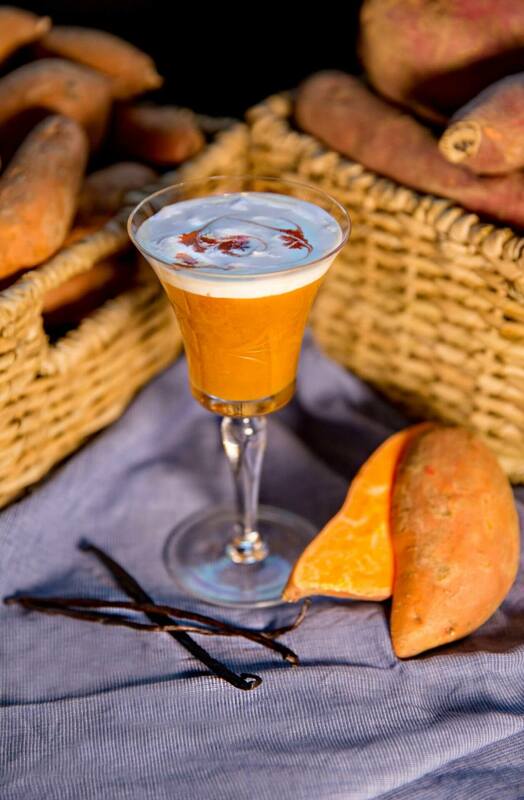 Roast sweet potatoes and blend with maple syrup, sugar, orange zest, water and vanilla extract. In a saucepan bring ingredients to boil, then reduce to simmer. Let simmer 8 minutes. Let cool and strain through mesh strainer or chinois. Combine heavy cream, vanilla bean pods, frangelico and amaretto. Remove spring from hawthorn strainer and put in shaker. Dry shake ingredients with sprig so that it acts like a whisk. Cream will thicken and become frothy. Spoon cream on top of cocktail and serve.